This post has 4,240 views. 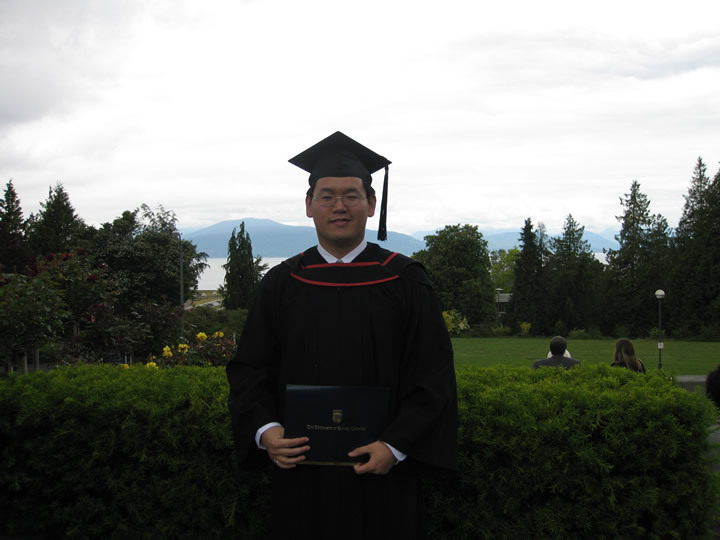 Today I finally received my Bachelors of Applied Science from the University of British Columbia. It took me five years to reach this point. It was a lot of work and a good chunk of time, but I think it was worth it (hopefully ). I have to thank my family… and friends I suppose… for their support through the years, and I have to thank some of my professors as well. Even though five years of university is more than enough for many, I’m not done with school yet. I’ll be heading elsewhere for graduate studies, but until then it’s vacation time. There is a lot of stuff I need to get done, but I should have plenty of free time as well. This will probably mean, among other things, that I’ll pay more attention to my websites and produce more artwork. I do have some sizable plans for my sites, and hopefully I’ll actually follow through with my plans. I’ll probably write a post or two about my last year as a undergrad student, but I’m too tired to start writing today. I’ll end this post with a photo of my graduation. Congratulations Tony! Finishing a degree is quite an accomplishment. Where are you going for grad studies? Thanks Ming . I’m going to the US for grad school. I won’t reveal the exact location on this blog yet though.